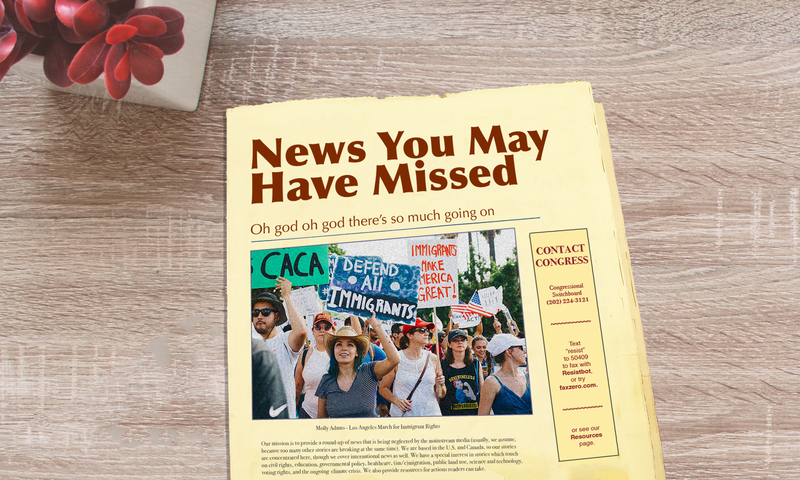 At this writing (March 24), News You May Have Missed finds it hard to know what to think about the Mueller report. Clearly Barr’s summary was crafted to put the most positive spin on it, but if it were completely misleading, would Mueller speak up? We expect that the devil is in the details and that it won’t be clear what Mueller has said until the full report (or mostly full) is released. Meanwhile, it would be easy for pressing issues to be muted in the noise—for example, flooding: the focus of this week’s issue. And the 2020 budget. 1. We’re all Nebraska now? At least three people are dead and more than 340 businesses and 2,000 homes damaged, some irreparably, by flooding in the Missouri River Basin from heavy rain and snowmelt, causing about $1.4 billion in lost crops, livestock, and damages in Nebraska alone. And it’s not over; see the story in the Science & Technology section. Farmers, already dealing with the fallout from trade agreements, are facing unprecented challenges, according to the Washington Post.Farmers may be losing a full year—even two—of income, in part because they were not notified in time by the U.S. Army Corps of Engineers and so could not move their grain. Some soybean farmers had more soybeans in storage than usual, waiting for a trade agreement that would bring better prices. In addition, farmers lost not just crops but impossible-to-replace topsoil, Gizmodo reports. Meanwhile, members of the Oglala Sioux nation on the Pine Ridge Reservation in South Dakota have been stranded with little food, water or medicine for two weeks, reports the New York Times. Emergency supplies can only reach the community by horse, boat or helicopter, and help from the federal government and the state has been slow to arrive. Compounding the difficulties, the drinking water system that serves 8,000 residents went down. The reservation was the location of the 1890 Wounded Knee massacre of 300 Native Americans by United States soldiers and the 1973 protest by members of the American Indian Movement. When the Russian River crested at 45 feet in February, floods overwhelmed small communities in Northern California, turning them into islands, leaving residents with no way to get in or out, according to the NPR. Hundreds of homes and businesses were demolished and thousands of people were evacuated. Damage was estimated at $155 million. Recovery has been slow and housing is scarce. 4. Children held in secret shelters. In the U.S.
Trump’s 2020 budget request would increase funding to the departments of Veterans Affairs, Homeland Security, Defense, and Commerce, and would significantly reduce spending for Health and Human Services, Housing, Education, State and USAID, and others, the Washington Post reports. The biggest loser is the Environmental Protection Agency, whose budget would be cut by 31%. More specifically, the budget would cut $241 billion from Medicaid, $220 billion from SNAP (food assistance), and $845 billion over the next 10 years from Medicare; it would eliminate the Student Loan Forgiveness Program. If you’d like to comment on this, Sarah-Hope has addresses. See the Resources section. On March 14, Cyclone Idai struck Malawi, Mozambique, and Zimbabwe. At least 557 of the 1.7 million people in the immediately affected areas have died and almost 110,000 have been displaced.. The homes—and crops—of something like 600,000 people have been destroyed (estimates are inexact). Continued rain and more than 150 square miles of flooding are slowing down rescue efforts. Electricity and running water are scarce. Cholera is spreading in Mozambique. The role of climate change is not precisely known since “scientists with the expertise simply don’t have the resources to do the large amount of computer modelling required,” but experts say climate change is not so much making cyclones more frequent, as more intense. The UN has allocated $20 million, the European Union the equivalent of $3.9 million, the UK $7.9 million, the United Arab Emirates $4.9 million, and Norway and the US $700,000 each. Neighboring Tanzania is providing “238 tons of food and medicine.” The disaster is so vast that more is needed. To donate, go to UNICEF, Doctors Without Borders, or, in the UK, DEC. The National Oceanic and Atmospheric Administration (NOAA) has released its annual spring flood outlook, predicting that two-thirds of the country is at risk for moderate to severe flooding. Fueling the flooding risk is rapidly melting snow in northern states, combined with rainfall measuring at twice the amount of average years. The combination puts the entire Mississippi river basin at risk for devastating floods. Already soils are saturated and reservoirs full—so any additional heavy rain, which is expected through May—is on a path to race down rivers and streams quickly. The damage to Nebraska, Iowa and Missouri is already calculated to be in the billions. These weather extremes are exacerbated by increased temperatures due to climate change, which “supercharges” storm events to produce about a third more rainfall than they otherwise would have, Ars Technica reports. A rich bed of fossils dating back 518 million years to the Cambrian period has been discovered along the Qingjiang river in Hubei province south China, with hundreds of species represented so far; the discovery offers a glimpse into a new ecosystem during the “explosion” that set the stage for complex life as we know it. Particularly exciting to researchers is the fact that around half of the fossil examples are from species never seen before, with an incredible quality of preservation showing detailed features of soft tissue. The Cambrian period is of particular interest, as Ars Technica reports, because it is the beginning of the fossil record for many kinds of animals we see on earth today whereas in periods pre-dating it, there seems to almost no connection to modern life aside from bacteria and algae. A study by the Shark Specialist Group for the International Union for the Conservation of Nature (IUCN) has shown that 17 of the 58 shark species surveyed face extinction, primarily due to overfishing. Among the endangered sharks is the short-finned mako, the fastest shark in the world, whose flesh and fins are prized as delicacies in Asia. A proposal from Mexico is due to be voted on to list the short-finned mako on Appendix II in the Convention on International Trade in Endangered Species (CITES), a listing which will provide regulation for the fisheries and some protections but stops short of a ban of the trade. According to Physics.org, sharks first appeared in the fossil record about 425 million years ago, making them some of life’s champion survivors. See the Resources page for opportunities to comment on the news. Donate to the victims of Cyclone Idai through UNICEF, Doctors Without Borders, or, in the UK, DEC.